The Northeast PHO (NEPHO) team provides a variety of administrative and clinical services for our providers. 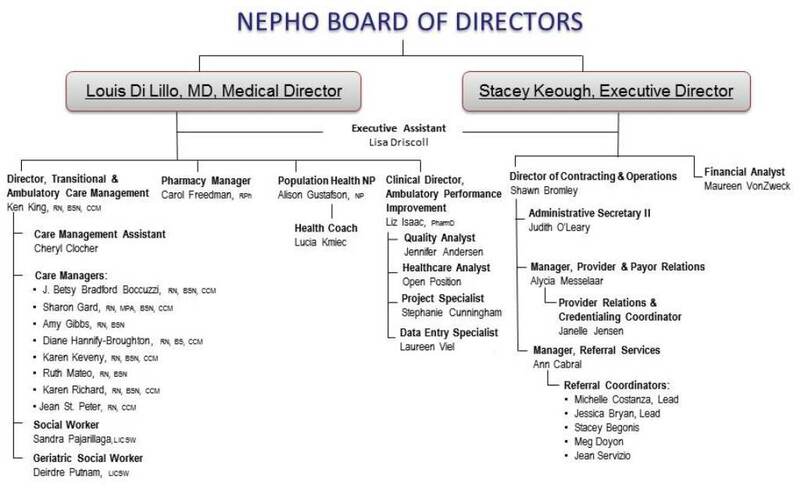 The organization is led by Stacey Keough, Executive Director and Dr. Louis Di Lillo, Medical Director; they are accountable to the NEPHO Board of Directors. NEPHO’s Executive Team also includes Shawn Bromley, Director of Contracting & Operations. Below is a NEPHO organizational chart and following that is a list of NEPHO colleagues with contact information.